Considering the ‘leaky pipeline’- are we missing the point? In 2013, a colleague of mine finished her PhD. After congratulating her, I asked if she was considering applying for academic jobs. I’d always assumed that an academic career was what doing a PhD was for, and I was curious about her decision not to pursue this path. I couldn’t understand why anyone would embark upon such a long and difficult road only to leave academia afterwards. I wondered what it could be about doing a doctorate that could be so off-putting, and whether it was more so for women than men. In 2014, I started my own doctoral research with women PhD students to try and answer these questions. Of course, individuals undertake a PhD for a variety of reasons; some career-related, some not. Though the traditional conception of the PhD is as an academic apprenticeship, this harks back to an age where an academic job was attainable for the majority of doctoral students, and before the Roberts Review brought a broader focus on developing research skills and training in doctoral degrees. However, the fact remains that in the current climate, a doctorate is a requirement for anyone aspiring to be an academic. Yet the experience of doing a doctorate is inherently gendered. Existing research shows that women have a less positive experience of studying for their PhD than men, which has implications for their career aspirations. Studies conducted by the Royal Society of Chemistry and the Wellcome Trust identified gendered patterns in the post-PhD career aspirations students in the sciences, with women being far less likely than their male peers to want to pursue an academic career after their studies due to factors such as expectations of geographical mobility to take up academic posts. Other research has found that women PhD students are less likely than their male counterparts to be encouraged to engage in activities relevant to building academic careers, such as publishing and presenting work. For the past two decades there has rightly been outcry at the under-representation of women in senior academic roles in higher education, including at the professorial level, and especially the lack of women of colour in these positions. Yet it is obvious that the experiences of women further down what has been described as the ‘leaky pipeline’– the term for how fewer women are found at increasingly senior levels of academia – are likely to inform whether or not women become senior academics – or academics at all. My own doctoral research, undertaken with first year women PhD students across disciplines, has shown that their experiences during the doctorate are critical in determining whether or not they can imagine themselves as future academics. Their experiences of academic life during the PhD often acted as a litmus test for an academic career, providing the opportunity to work out whether or not this career was for them. Participants in my research were often discouraged from their initial academic aspirations by witnessing the pressure their supervisors and other academics were under to publish papers, and to totally dedicate themselves to work at the expense of a healthy work/life balance. Observing the discrimination that women academics faced, along with the increasingly competitive academic jobs market and the proliferation of short-term, insecure contracts, meant that pursuing an academic career was often not an appealing prospect. A further issue which contributes to the ‘leaky pipeline’ but which is rarely commented on is the lack of parity in the numbers of women undertaking doctoral degrees. Despite the ever-increasing numbers of women studying for undergraduate and postgraduate taught degrees in the UK (55.3% and 58.7% respectively in 2014/5), this drops off considerably in relation to postgraduate research degrees according to recent data from the Equality Challenge Unit. Compared to the significantly higher proportion of women at undergraduate and postgraduate taught levels, we see the number of women doing postgraduate research degrees drop to 47.4% in 2014/5. There is also little ethnic diversity among doctoral students, which is particularly significant in relation to race equality in the academy; according to ECU data in 2015/6 just 16.8% of doctoral students in the UK were from BME backgrounds. Thus fewer women, and BME individuals, undertake the qualification which is required to become an academic in the first place – which has clear implications for the future of the higher education sector. The findings from my research highlight how women PhD students become discouraged from an academic career because they struggle to establish a sense of belonging within their academic communities as doctoral students. They often envisaged that as early career academics they would face gender discrimination, and were put off by expectations of geographical mobility to pursue an academic career, which was likely to involve competing for a series of short-term, temporary contracts. The challenges they encountered during their studies, such as gendered expectations of their abilities, meant that the majority struggled to imagine themselves as future academics, despite aspiring to academic careers at the start of their studies. These findings correspond with research by the Royal Society of Chemistry, and the Wellcome Trust, which reported that women PhD students were more likely than men to change their minds about pursuing an academic career during the doctorate. My research calls for institutions to take action to address the under-representation of women in the doctoral student community, and to work to ensure equality in their experiences. Women studying for undergraduate and postgraduate taught degrees should be encouraged to consider studying for a doctorate, and efforts should be made to ensure that departments are inclusive and supportive of women doctoral students. This is vital if we are to create an inclusive higher education sector which reflects the range of available academic talent, and which enables women academics to progress their careers at the same rate as men. A good few months ago, one of my PhD colleagues gave me this; the tiny book of viva prep. I laughed and said I couldn’t conceive of needing it any time soon. Now, with less than 10 weeks until my viva, it feels like I might have to open its tiny pages and start preparing for the most important exam of my life. As might be obvious, so far I’ve very much taken the ostrich approach to thinking about the viva. The thought of submitting the thesis was beyond me until I handed in my first full draft to my supervisors in September 2017 ­– only at that point did completing it actually feel possible. So I think it’s fair to say that I have always had some level of denial about ever having to do a viva! The weeks before I actually handed in the thesis, and the viva became an imminent reality are something of a blur to me now. I set the date some time ago, because I had booked a holiday in the days afterwards for my partner’s 30th, and knew I’d need a break and a change of scene. Looking back on this period, the things that stand out most to me are my short temper, physical exhaustion and interestingly, an almost complete lack of motivation – the last thing I expected at this stage. In terms of getting support from others to help me submit the darn thing, I couldn’t have asked for more. My partner looked after me, cooking and sorting out the house even more than usual, I had messages of support from friends and family, and my supervisors were fantastic, turning around feedback on my draft chapters in a matter of days which gave me valuable proof-reading time. But I was really struggling to make myself do those final few changes, to re-read for spelling and grammar errors, and to get to the end of my checklist of things to do before submitting. I think a lot of this was mental exhaustion; I could barely take in the meaning of my own words any more. I stared at the screen for so long that I gave myself eyestrain, scrolled through the thesis so often that I aggravated the RSI that I’d developed earlier in the PhD, and genuinely lost the ability to evaluate the quality of my work. Having talked to friends and peers, and reading blogs and guidance literature about submitting a thesis, this is pretty normal. But I think that a considerable part of this poorly-timed lethargy was to do with actually not wanting to finish. It seems so odd to admit that and see it in black and white, especially considering that all I talked about for the last year was being able to get the thesis done. That’s always the goal, the endpoint you hope to reach when you start a PhD. Yet I had slowly begun to realise the huge sense of loss I would feel without it in my life. It’s been my motivation, my passion, my reason to get out of bed every morning for three and a half years, and to suddenly be deprived of that felt like an extremely daunting prospect. The last few months have brought a significant amount of personal upheaval, and finishing the thesis has strangely enough been the thing that has kept me going, the thing which has given me a sense of purpose. The day before I handed in, I wrote this in my research diary: “I feel like I want to cry and it’s all so weird and unreal and I am so tired and I can’t wait for it to be over but I feel very scared about the prospect of finishing”. So, much as I am hugely relieved to have the weight of submitting off my mind, and proud of what I’ve achieved, I can’t help but feel sad that it’s over. On the whole, I really loved doing my PhD. The autonomy, the flexibility of working when I wanted, the ability to take up a range of opportunities during my studies, is something I really appreciated, and something I am unlikely to experience to the same degree in my career again. Back in October 2016, at the start of what I naively referred to as my ‘final year’ (!) I wrote a post where I discussed how Phillips and Pugh (2015) describe moving through the doctorate as ‘the progressive reduction of uncertainty’. I questioned it then, and reflecting on this now, I’m even more sceptical! Do I know more now than I did then? Yes, obviously. Do I have a sense of what my research has contributed to the field? Yes, definitely. But am I no longer uncertain? Absolutely not. If anything, writing the thesis has taught me the value of uncertainty, and how to make progress even when things are unclear. It has given me tenacity, and helped me to cope with not knowing all the answers. I’ve learned to decide on a course of action, and to justify my approach and findings – despite all the other possible ways of doing the research, and writing it up. Now, forcing myself to take my head out of the sand and engage in preparation for the viva, I hope that these skills are enough to help me overcome one of the most uncertain events I am likely to encounter in my career, and to cope with whatever it brings. Back in summer 2016, I was approached by an enthusiastic first year PhD student at my institution called Fiona Martinez. She wanted my help to set up a network for women postgraduate students, feeling that it was important that women had a chance to meet each other and discuss the challenges facing women working in academia. She had already drafted some aims and objectives for a network for women postgraduates, got agreement from the university to set up the group, and secured funding for the next academic year. My first thought was why I hadn’t already thought of this?! Not only is my research grounded in feminism, focusing on the experiences of women doctoral students, but I had also experienced isolation during the first year of my PhD and found it difficult to meet like-minded peers. We recruited another member, Larissa Povey, to our organising group and put together a calendar of events for the upcoming year, including sessions on negotiating the work/life balance during postgraduate study. There seems to be a growing recognition of the issues facing women working in academia. Similar networks aiming to bring women students together exist at institutions across the country, including at the University of Edinburgh and University of Lincoln. At our first event, we discussed the lack of women in senior roles (currently 22% of professors in the UK are women, according to the Equality Challenge Unit’s 2016 figures, and just 17 professors are Black women), the gender pay gap which stands at 12.6% (UCU, 2016), and the relative lack of women in traditionally male-dominated disciplines such as engineering and in the sciences. Our network enables women students from across SHU to meet and socialise as well as providing a safe space for the discussion of issues affecting women in academia today. However, we feel that the network also has a practical role to play in supporting women students in their career development- acknowledging that women PhD students are less likely than men to be encouraged to engage in career development activities (Dever et al., 2008). We provide women postgraduates with opportunities to build on their research skills, and are organising events such as how to get your work published, and a workshop on presenting your work at conferences. 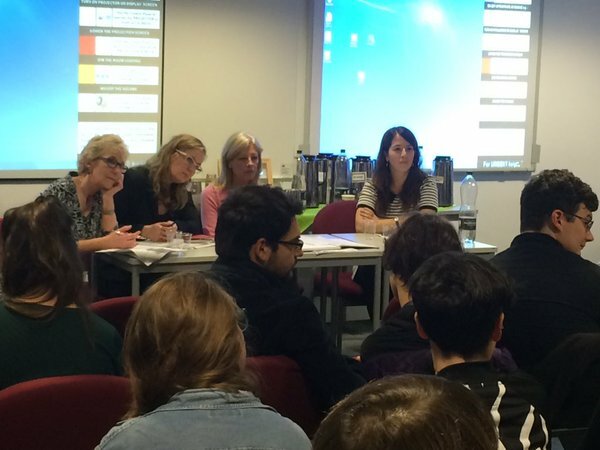 We have also held workshops for undergraduate and Master’s students where current PhD students shared their experiences of applying for doctoral study, and the realities of doing a PhD. At our launch event earlier this month, the Head of the Graduate School in one of our largest Faculties, Professor Lisa Hopkins, shared her personal career journey with us, starting with an anecdote about one of her first teaching jobs where the cleaner presumed she was a student rather than the lecturer. She drew attention to the institutional sexism that women academics at all levels have faced, highlighting the experiences of Liz Schafer, a Professor in Drama and Theatre Studies at Royal Holloway University who took legal action in 2010 after discovering that women Professors were paid less than men in the same roles. Professor Hopkins also commented that women are often ‘good citizens’ of the academy, who engage in time-consuming activities such as being committee members, rather than activities which are more focused on career development. However, she also expressed her feeling that engaging in ‘academic citizenship’ was important in women helping other women to succeed, and that we all have a responsibility to help others and recognise the efforts of those who have supported us. Our network has been very well received by women students who have attended our events, as well as by key figures at our institution. The Vice-Chancellor, Chris Husbands who also attended our launch event, expressed a great deal of support and enthusiasm for our network. Yet despite the success of our launch event, for me it is the monthly interactions with colleagues and peers who come together to seek company, support, and solidarity, which are the most important. Our regular events provide a space for women to come together and support one another- speaking back to Professor Hopkins’ message about helping each other, which is an act of resistance within a culture which promotes individualism and competition. This network helps us to resist the individualistic culture of the academy, promoting and helping to maintain a culture that is instead both collegial and feminist. 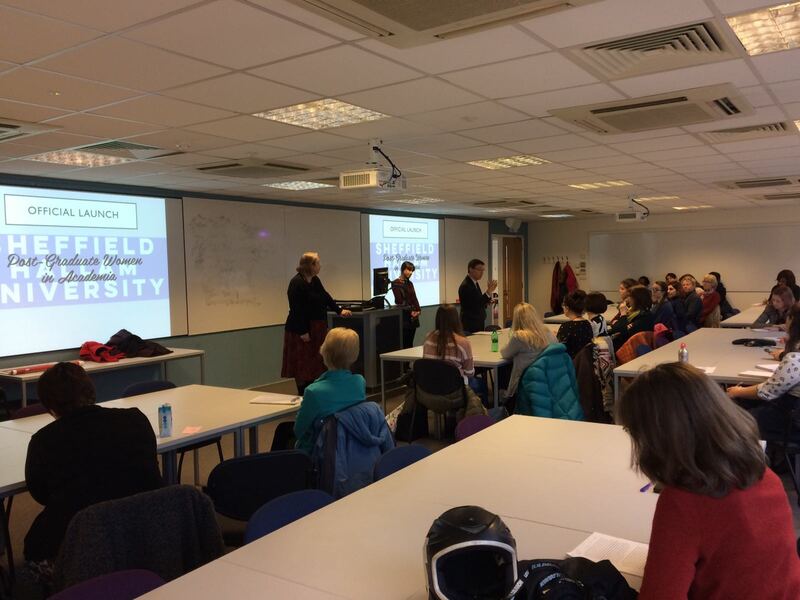 Now more than ever, it is vital that women are able to come together and support one another, and Fiona, Larissa and I are proud to have created a community which has started to do this for women students at Sheffield Hallam University. We look forward to our next big event which will be on International Women’s Day, where we will explore women’s academic career experiences with our guest speaker Professor Sandra Eldridge, and discuss feminism in the academy. Above is the most accurate visual representation of a PhD I’ve come across. Though I think I’ve cleared the ditch filled with water, I think there are still a fair few curveballs to be sent my way- but hopefully some ladders to help me back up. Something that many of the participants in my study- women doctoral students- have said is that they expected the PhD to be hard, but not in the ways that it has been. They anticipated that it would be intellectually challenging, but not that issues such as financial concerns and problematic relationships with supervisors would present such bumps in the road on the way to achieving a doctorate. Studying for a PhD has been described as a ‘high risk strategy’ (Brailsford, 2010) because of the significant investment of time, money and energy by individuals for an outcome which is not guaranteed. Stories of drawn-out PhDs which have taken more than four years to submit, and those who have an unexpectedly difficult viva without the result they were hoping for, are commonplace- and I am conscious that before too long that could well be me. As I begin my final year of the PhD, I can’t help starting to feel daunted by the reality of needing to get the thesis done. The clock has always been ticking, but it is only as I realise that I have (just under) a year left that I have become very aware of its presence. Other than doing practical things like saving for the inevitable ‘falling off a cliff’ sensation I’ll experience when my funding stops in 12 months, there isn’t a lot else to be done. I’m looking at jobs, working out what skills I have that would be useful to draw on when applying for these kinds of jobs , and what other skills I still need to acquire. Beyond this, what I need to do is focus on writing and not get too distracted by thinking about the future- easier said than done, though, when you are faced with the possibility of having no income when October 2017 comes around. In terms of my thesis itself, though, things are going well. After a difficult few months earlier this year, I have managed to write a decent amount, particularly over the summer before my teaching responsibilities came back around. After deciding to rein back my data collection things felt more manageable, and though I resisted doing this at first, it was one of the best decisions I made. I’m also still very interested in my topic- something I know others struggle with during the final year, and I have been able to develop a timeline for completion which plans out my progress on a chapter by chapter basis. The current plan is to have a draft thesis written by the end of May- which I’m sure I will look back on with scorn and derision- but my intentions are good! Interestingly, Phillips and Pugh (2015: 97) who wrote a guide called ‘How to get a PhD’ describe moving through the doctorate as ‘the progressive reduction of uncertainty’. The diagram below shows their interpretation of the different stages. In some ways, I can see what they mean. The best thing about final year so far is the feeling of knowing what I’m doing and how the thesis will probably look- an unfamiliar but fortifying feeling. I know what I want to write and the aspects of my data that I want to focus on, and that’s great. In other ways though, I think their claim is problematic. The PhD is not just about getting a thesis written. Starting the PhD, I had such a sense of certainty. This is probably because the six months before I started had been characterised by stress and upheaval, as I was eventually made redundant as the result of a restructure in the organisation I worked for. Before that, I had spent the years after I graduated from my undergraduate degree wondering what on earth I was going to do as a career. When I began the PhD I felt that I had finally found something that I wanted to commit the rest of my life to doing. I had three, seemingly long, years to explore a subject that I was interested in, and the freedom to go about doing the research in the ways that I thought were best. I had opportunities to go to conferences, to meet like-minded people, to organise events and develop my teaching skills. I was also fortunate enough to have guaranteed funding for that period of time. As I approach the end of the PhD, I am starting to feel less and less certain about the future. For now, I have a purpose, and goal to work towards- the completion of my thesis. I have the identity of being a PhD student, and an Associate Lecturer. What will I be after my PhD? I have no idea. The benefits of having peers and colleagues around me every day, students to teach and opportunities to present my work at conferences, are unlikely to be available to me in the same way after I complete my PhD. There’s no way of knowing. All I can do is follow one part of Phillips and Pugh’s advice laid out in their guide for doctoral students, and treat the PhD as a ‘job to be finished’ (Phillips and Pugh, 2015: 90), so that I can move on and deal with whatever comes next. Doctoral study has traditionally been thought of as the start of an academic career, with doctoral students working as ‘apprentices’. However, the influx of PhD students into UK higher education over recent years, and the lack of investment in early career positions in universities, has led to increased competition for academic jobs. My research into the career aspirations of women doctoral students aims to highlight the internal and external factors that shape whether or not they choose to pursue an academic career. Their perceptions of academia are largely shaped by their experiences during the PhD, as well as wider, structural issues within academia. Last week’s strike by UCU, the trade union for university staff, brought to the fore many of the underlying problems in UK higher education. They highlighted the increasingly insecure nature of academic contracts in institutions with a significant number of staff on casual contracts, as well as the persistent gender pay gap- where male university staff earn on average 12.6% more than female counterparts. In the same week, a Russell group institution advertised a humanities ‘teaching associate’ who would be employed on a ‘part-term, fractional (permanent) contract’, meaning the post-holder would only be employed for 36 weeks of the year. The latest Academics Anonymous article in the Guardian highlights the challenges of living on a casual academic contract. Women in academia are affected more than men by increased casualisation. They are more likely than men to work on temporary contracts, as well as and on contracts that are weighted more towards teaching than research (Morley, 2013)- in a system that gives higher status, and financial reward, to those working in research. In a higher education system that values and rewards research over teaching, it is easy to see how this contributes to the lack of women in more senior academic roles- just 22% of all professors are women (HESA, 2015). My research examines the career aspirations of women doctoral students, and how their aspirations are shaped and changed over the course of their PhD. It is situated in literature such as a study by the Wellcome Trust, (2012) which found that despite initial aspirations of an academic career, by the end of the doctorate women were considerably less likely than men to want to pursue a career as an academic. But why is this? Other researchers have found that women often do not receive adequate support or mentoring during their PhD (Bagilhole and White, 2013), can face overt and covert sexism (de Welde and Laursen, 2011), and those with caring responsibilities experience role conflict (Brown and Watson, 2010). In addition, a series of articles in the Guardian’s ‘Academics Anonymous’ pages highlights the difficulties facing those working in academia. These include institutional sexism, the rise in mental illness amongst academic staff as a result of overwork and stress, as well as the difficulty in maintaining a healthy work/life balance. What does this mean for the participants in my study? In my interviews with them, their perceptions of academia are largely negative. Should they decide to pursue an academic career, they expect to encounter a range of barriers- from intense competition for jobs to having to move around the country to find work, and struggles in combining work with family life. Though they are passionate about their research and love their subjects, they perceive the environment within which they work as potentially damaging: “there are so many reasons not to be an academic, like the working hours and the expectations… the stress looks crippling at times”. These negative perceptions of academia are clearly shaping their career aspirations- of those who had initially been eager to become academics, a significant number of them are reconsidering. Discussing the career options they have considered for after the PhD, one woman who initially had expressed a desire to become an academic told me that she was now considering roles outside of academia, as she felt that this would enable her to still do some research “without having to have the whole academic extravaganza of misery attached to it”. Many of the reasons they give relate to working in an environment where they are expected to work ‘crazy hours’, are put under significant pressure to publish papers alongside working on their thesis, and are often expected to prioritise their work over everything else in their life. Significantly, participants often refer to viewing the behaviour of their supervisors or other academics in their department, and feeling that they want to avoid working in this way. One participant described how her supervisor frequently emailed her in the middle of the night and on weekends: ‘It… really puts me off, I’m just like, I really hope I don’t become like that”. This idea that doctoral students do not want to imagine themselves in academic roles because of their negative perceptions of academics around them, is of concern- and should make supervisors reflect on their position as potential role models for PhD students. It is unsurprising that these negative perceptions of academia may well be discouraging women doctoral students from pursuing academic careers. The knowledge that competition for any kind of academic role will be high, and that these roles are likely to be temporary and require relocating, combined with the pressures to publish and expectations of working long hours may well mean that women choose not to pursue a career in academia. My research aims to explore the factors which contribute to and shape individual’s career aspirations. Career decisions are taken for a variety reasons, yet it seems undeniable that doctoral students are discouraged from pursuing an academic career largely because of structural problems within academia itself. The increasing casualisation of academic work highlighted in the recent actions of UCU continues, and inevitably will have a negative impact on the aspirations and career decisions of doctoral students. It’s been a strange couple of months. Between recent illness and receiving some sad news, it has felt difficult to focus on my work or feel that it is very important in comparison to other things that are going on. The benefits of doing a PhD are a high amount of flexibility and being able to direct your own time. However, this also means that when things aren’t going so well, no one is there day-to-day to make sure that you are still getting on with your work. But time has been marching on nonetheless- I’m now 18 months into my 3 years of funding, and the fact remains that I have to finish this thing. Second year is an odd time. People who are further ahead with their PhD than me say that second year was their favourite because by this point you know what you’re doing (unlike in the first year), but aren’t under the pressure to finish like during the final year. I understand what they mean, but in a way I feel like things are more uncertain than they ever have been. First year, though scary because most of the time you have no idea what you’re doing, was at least more structured. At my university, the upgrade process was divided in two, which meant that there were two defined deadlines for which I had to write progress reports. Compared to this, second year feels like a mass of uncertainty. It feels like all of my work is built on shifting ground. I have data, but little analysis. Ideas for how I’m actually going to write about my data change all the time. After finishing my first draft chapter I feel like I ought to have a clearer picture of what the rest of my chapters will be like, but in reality I just don’t. One of my supervisors has told me that I just need to embrace the uncertainty and accept that eventually it will all come together, but I’m finding this really difficult! Since the start of February I have had quite a few self-imposed deadlines. I’ve needed to submit abstracts before closing dates, write and deliver conference presentations and teach lectures and seminars. Glad as I am that these things have been successfully completed and are now behind me, they served as key milestones to be worked towards. Having these deadlines also forced me to complete particular amounts of work within timeframes that otherwise I would probably not have worked to. Sometimes I wish that the PhD was more structured and that someone would just tell me what to do for a while. I especially feel this way at the moment, when it feels difficult to work because of other things happening in my life. Yet I know that a lot of the value of doing a PhD lies in learning to be self-motivated and have faith in my own judgments and decisions about my work. I’m gradually realising that completing a PhD is much more about endurance and resilience than it is about intelligence or knowledge. In his research on the stages of doctoral study, Grover (2007) refers to second year as the ‘stage of engagement’ where students begin to work with a clear sense of purpose. Nice as this sounds, I’m not sure it’s particularly accurate. I’d argue that second year is actually more about learning to grit your teeth against the uncertainty and focus on the long-term goal- finishing the bloody thing! So in the next few days I’m going to try and do this. I’ll spend some time assessing what I’ve achieved so far, reflect on what I’ve learned, and consider how to move forward into the second half of this endurance test we call the PhD. After recovering from the shock of it being both January and 2016, I’ve come to realise that this PhD is actually going to involve me writing a thesis. Not only that, but it turns out they take a really long time to write and the sooner you start writing, the better. Who knew? My study is longitudinal and involves me doing interviews pretty late on in my PhD- in the first few months of third year- and if I have any hope of finishing on time, I need to be writing as I go rather than waiting until third year to write the entire thesis. I confess I have been a little in denial about the whole thing. I’ve loved interviewing so much, and having just completed the second round of interviews with my participants, I’m now having to face the fact that I have to try and turn these women’s experiences- their hopes and dreams which they have so willingly shared with me- into a coherent, academic piece of work. It feels like a big responsibility, and pretty daunting if I think about it too much. I have nothing resembling a chapter at this point. Not that it’s good to compare yourself to others because every PhD is different, but it is a little concerning when you hear from people who began their PhD at the same time that they have three draft chapters already. I do have some material to work from- even if it is only a threadbare literature review, an incomplete methodology and some musings on my initial data. But it’s something, which is generally better than nothing. It’s the data chapters which intimidate me the most. Despite (partially) conquering my fear of engaging with my data (which I wrote about last year- see here), now that I have to actually write about it I feel the same old familiar panic start to descend when I open a new document in Word. Speaking to a fellow PhD student recently, we shared our fears about writing. We both admitted that because we felt what we were about to write was bound to be dreadful and juvenile and meaningless, we avoided even starting. Something can’t be dreadful if it isn’t written, can it? But your own weak and weedy words staring back at you can seem to prove your worst fears- that you in fact really have nothing intelligent or interesting to say. In addition to this fear of the blank page, as a feminist researcher I’m acutely aware of the need to write in a way which does my participants and their stories justice. How do I represent the richness of their lives and the fullness of their experiences in just five or six chapters? There have been extensive debates amongst feminist researchers about the possibility of ‘giving voice’ to others (see for example, Olesen, 2005), and the seeming impossibility of this task doesn’t make beginning writing any easier. Writing is a discipline, and it’s one I need to develop. Early on in my PhD, my supervisor recommended that I read On Writing by Stephen King. Unlike my partner, I’m not really a fan of sci-fi/horror so had never read any of his fiction, but encouraged by the fact that it was not an ‘academic’ book, I got it out of the library and later went out and bought my own copy. King talks about the need to write every day, for at least a couple of hours- even if all you produce is utter drivel. He argues that writing is a process, a tool which needs to be kept sharp, and that the only way to do this is to force yourself to sharpen it every single day- even when you don’t feel like it, even when you feel like you have nothing to say and even when you hate every word you write. There are lots of things I want to do this year. There are fantastic sounding conferences in lovely places that I want to visit, journal articles I want to write and publish, teaching I want the experience of doing, not to mention money that I want/need to earn. However the one thing that I really need to be doing- as my supervisors helpfully remind me- is writing. Even if it’s not very good, even if I have other commitments which mean I can only do an hour some days, and even if it’s absolutely the last thing I want to be doing. There might be a lot of things I want to do this year, but not all of it will be possible. I intend to start as I mean to go on, however, and at least this post is evidence- both in theory and practice- of my commitment to writing and my determination to be afraid of it no longer- or at least a little bit less. After I did the welcome, Carol introduced the day by talking about why feminism continues to be important and relevant. She argued that feminism can be an incitement to combat social injustice, and that it has always been a means to confront the abuse of privilege and power in many different contexts. As a form of activism it connects the personal with the political, and is a ‘politics of hope’. She emphasised that feminism is about taking action, however small, to gain equality. Carol then outlined the ongoing importance of feminist methodologies. Feminist methodologies are about innovation and practices of experimentation, so that we can do research differently. They are about producing different sorts of knowledge and ways of knowing in order to combat gendered forms of social injustices more effectively. Feminist methodologies are about the bridge between practice and research: they open up spaces for thinking about profound questions about being, knowing and ethics. The event highlighted some excellent examples of the innovative feminist research being done by postgraduate students. We’d like to talk about all of them but can’t so we focus here on two presentations! Alyssa Niccolini, an Education student from Colombia University, did a presentation on glitch methodologies. ‘Glitch’ is about using an app that can be downloaded which then ‘messes up’ or scrambles an image or text. As a methodological intervention, glitch is about introducing a gap, or an interruption, into the research process to try to capture affective moments. Glitching also highlights issues of researcher power and disrupts usual ways of doing research. Alyssa’s research into censorship moments in class illustrated how glitch methodology can open up questions about how data can be analysed and presented. In the second parallel session of the day, Ben Vincentfrom the University of Leeds spoke about non-binary transfeminist methodological considerations. They highlighted that in doing research with this group, it was crucial to reflect on issues such as access, rapport and risk and to ensure that participants’ chosen pronouns were respected. They also discussed the ways in which transfeminist perspectives have been marginalised in the academy and argued that feminism must include all those who embrace non-binary identities. Keynote speaker Professor Jessica Ringrose of the UCL Institute of Education spoke about the resurgence in feminist methodologies. Her presentation problematised the concept of ‘research impact’, and considered the different ways in which feminist researchers could interpret and re-imagine it. She argued that it is essential for feminist research to have an impact, in terms of having ‘making a difference at its heart’. However, she questioned the impact ‘agenda’ where demonstrating the impact of your research is vital to secure funding through the Research Excellence Framework, and critiqued this agenda as being part of the neo-liberal higher education system. Reflecting on her own practice in Education, she argued that feminist researchers should aim to generate interesting data but simultaneously to make changes in the world, and that researchers should ensure that they ‘lived their feminism’. She also noted that doctoral researchers in particular should be making connections with key individuals to publicise their research, for example linking with journalists and university press officers. She highlighted the advantages of utilising social media to communicate research to other audiences, and recommended strategies such as blogging for targeted audiences. The day ended with a panel which I chaired, which featured Professor Ringrose, Dr Carol Taylor and Professor Julia Hirst, Reader and Principal Lecturer in Sociology from Sheffield Hallam University, and gave students the opportunity to ask questions about the challenges involved in doing feminist research. Professor Hirst commented on the need for both schools and universities to recognise continuing gender inequality and urged those of us doing feminist research to acknowledge the scope we have for effecting positive change. It really was a fantastic and inspiring day and I’m so glad it was worth all the effort of organising it! It was so good to meet other postgraduate researchers doing feminist research, and I look forward to keeping in touch with those who came along. To see a Storify of all the tweets from the day click here. Also thanks to attendees Emily Nunn and Devina Lister who also wrote blogs about the event. Recently I reached a significant milestone in my doctorate; my research was formally recognised by my university as being good enough (hopefully) for a PhD! I have just completed my institution’s ‘upgrade’ process and have been officially confirmed as being ‘on track’ to achieve a PhD- after another couple of years of work, that is. The upgrade is unique in that it is generally the only formal assessment you will be required to do after starting your PhD but before your viva. This process is called something different at every institution- but is usually referred to either as the ‘upgrade’ or ‘confirmation’. It’s an important milestone, as the judgement made by your institution determines whether or not your work is of a standard worthy of a PhD. If not, you are not allowed to continue with your research project and cannot ‘progress’ to a PhD. However, in this situation it’s likely that you would be awarded an MPhil degree for the work you had already completed. The upgrade usually consists of a written element and a presentation on your research which is made to an examiner. This is supposed to be similar to the final viva, in that you will need to justify and defend the choices you have made in doing your research. At my institution, we did the presentation to an examiner in an open session, where anyone interested in your research could come along and ask questions. Personally, I found the upgrade a time-consuming and stressful process. I’m a naturally impatient person and I wanted to have it over and done with so that I could concentrate on other things. Also, despite the fact that I’m generally confident about my work and my supervisors had said there was no cause for concern, I was intimidated by the prospect that my university could turn around and tell me that what I had done so far wasn’t good enough, and wasn’t worthy of a PhD. However, in hindsight the upgrade process was both useful and productive. I had found drafting and re-drafting my written report frustrating, but in doing this I was forced to refine my justifications of the decisions I made in the research. It made me stop and reflect on the progress I had made in my first year, and required me to start making the arguments that I’ll need to make in my viva about the value of my research. Also, some of the questions that I got from my examiner after the presentation were really useful in giving me ideas for where I could take my research in the future, and helped me to reflect on aspects of my data which I had not previously considered. All in all, I’m really pleased to have the upgrade behind me. I’m glad that I can now move forward, and that my research (and I- it’s hard to separate them sometimes) have been deemed good enough. A colleague of mine pointed out that the reason that he felt great about it was because passing the upgrade is a validation of your work, and there aren’t many times where you get this officially! For those of you who are concerned about the upgrade, try not to worry too much. Even though everyone had told me that it would be straightforward, I worried and prepared and moaned about it anyway- but it really was fine in the end. Have confidence in your work and faith in your ability to justify what you’ve done. And for those of you who have recently passed the upgrade, take this opportunity to celebrate. In the PhD you don’t get many formal milestones, so make the most of the chance to enjoy your achievement, and reflect on everything you’ve learned so far. As students flood back into the city and onto campus, standing in doorways and wandering forlornly from building to building, it feels incredibly busy at my institution. But this summer was a strange time. Having worked in universities for a few years before starting my PhD, I knew that the end of the academic year meant a few slow months before students returned in September- but what I failed to realise is how that makes you feel when you’re continuing to study through that period. Working towards my upgrade, plodding through interview data and attempting to write a coherent literature review in an office which was steadily emptying of people felt increasingly difficult. My supervisors were (understandably) away and/or busy with their own projects a lot of the time, and I felt guilty about contacting them. I was also distracted (but delighted) by the arrival of my first nephew. Having had a productive and enjoyable few months, I had developed some confidence in my work and the PhD had felt manageable- but at this point I started to really doubt whether or not I was capable of doing it. A low point was bursting into tears one lunchtime in July because I didn’t see how I was ever going to understand ontology and epistemology, let alone talk about the epistemological position I would take in my research. So many things that I read seemed utterly impenetrable, and I was becoming increasingly demoralised by my lack of understanding. All in all, my motivation to work on my PhD was pretty low and my belief in my abilities was shaky at best. Some time earlier I had registered to attend a conference for postgraduates entitled Life Beyond the PhD. It appealed both in terms of my potential career, but also because it was particularly relevant to my research area- exploring the career aspirations of doctoral students. But when it came to leaving Sheffield for the conference, I really didn’t want to go. I find conferences fairly intimidating prospects at the best of times, especially if they involve staying away for a few days and if I don’t know anyone else going- but at a time when I was doubting whether the PhD was even do-able, it seemed a bitter irony to be attending an event which involved reflecting on what to do after completing it. The conference took place in one of the most beautiful places I have been. Colleagues of mine have been to conferences in Florida, Belfast and Paris, but Cumberland Lodge, a 17th century house in the grounds of Windsor Park (with its own library!) was a wonderful place to be, especially during a three day period of sunshine. This conference happens every year, and I’d definitely recommend it to any PhD student- it gave me a new perspective both on what my future might look like, but also on the struggles I was experiencing in my work at the time. I was really surprised at the range of students who attended- from a variety of disciplines and institutions, but also at lots of different stages in their studies. There were people like me in their first year, but mostly people were in their final year- some had submitted their thesis, or were just about to which was great- for me it was so nice to meet people who had reached the seemingly impossible stage of finishing! Usually there are quite a few sessions at conferences which are dull, irrelevant or just not worth bothering with. That just wasn’t the case here- the sessions had clearly been well thought-out and were targeted; in the first one we had talks from former PhD students from different subject areas who had forged careers both inside and outside academia. We were also made to work- as well as all delegates doing a poster presentation and an individual presentation of their research, lots of the sessions focused on getting us to work together- for example we were asked to develop an interdisciplinary research proposal to present to a potential ‘funding panel’. For me, one of the highlights of the conference was the CV and applications workshop given by advisors from the Cambridge Careers Service. We had all taken a hard copy of our current CV, and within an hour of the session we were all sheepishly scribbling all over what we had brought and feverishly making notes of what we needed to be doing instead. We considered the kinds of questions we might be asked in an interview, using an example of an existing job description, and interviewed each other. It made me realise that I had given very little thought to the realities of finding a job after the PhD. I’d be lying if I said I went home from the conference 100% rejuvenated and with my confidence built back up again- but I did go home with a plan. I met lovely people who had all had different routes to and through the PhD, which made me realise that there’s no ‘right’ way to go about doing it. I realised that there are a range of things that I could do in the future, and that I needed to consider a wide variety of career options (and update my CV!). I found out how I could get involved in public engagement activities, and considered how I might work more with others from different disciplines. For someone whose research involves individual conceptions of academic careers, I realised how much I hadn’t known. But most of all, I learned that going somewhere beautiful for a few days, away from a desk and the noise of a city, meeting interesting and friendly people in the same position as you, and taking some time to reflect what you want your future to be, can be the best possible antidote to the summer blues.